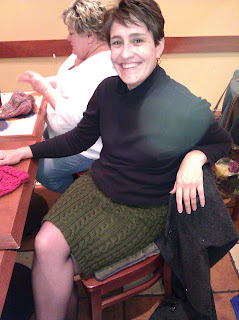 I promised I would post a picture of the cabled skirt when it was done. Here you go. This was taken during our Thursday night Knit & Crochet group. Special thanks go out to Charles - you are a dear, and we love to pick on you. Thank you! Psst! That's my friend Kim behind me. Hi Kim!